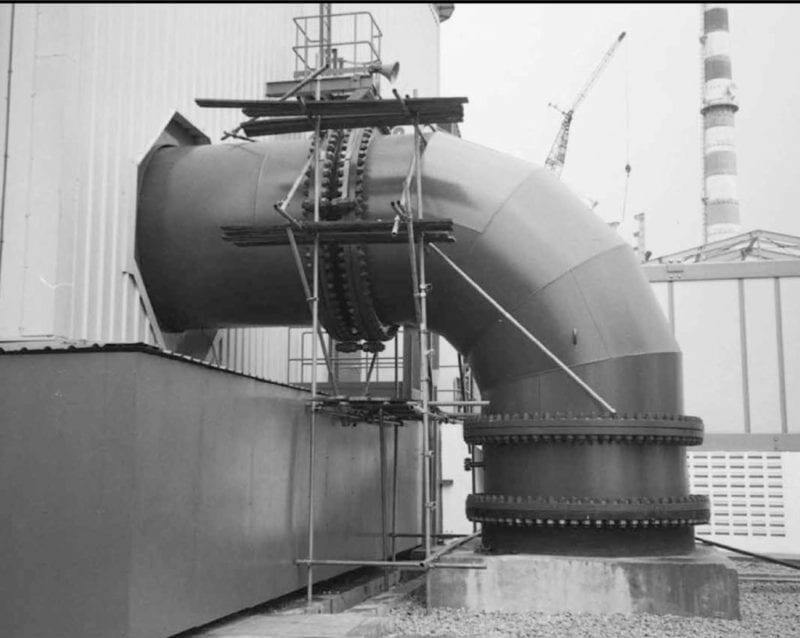 Mercer’s Style 501 96” diameter expansion joint employed in a pressure balance configuration in a Malaysian power plant. Pressure balance configurations are used in unique applications. As the name implies, its function is to balance, or cancel out, the internal working pressure in order to minimize the net end loads acting on adjacent piping or equipment. This arrangement is typically used when the piping system cannot facilitate an anchor or when the loads on adjacent equipment, e.g. condensers, turbines, etc., must be kept to a minimum, while offering a means for accepting external movements. The two expansion joints perform together to accommodate external movement, e.g. thermal, vibration, settlement, etc. For example, if the pipe moves laterally into the “T”, the two expansion joints will deflect laterally to its axis. Alternatively, if the pipe moves axially, or in line with the two expansion joints, one expansion joint will act in compression while the other acts in extension. In many cases, the additional stiffness forces of the two joints are considerably less than the reduced pressure thrust forces, demonstrating the benefit of this arrangement. This is a simplified description of a pressure balance configuration and in practice many additional factors require consideration. If this arrangement qualifies as a potential solution to your system requirements or if you would like to know more about pressure balance applications, please contact us. We will be pleased to assist you in any way. 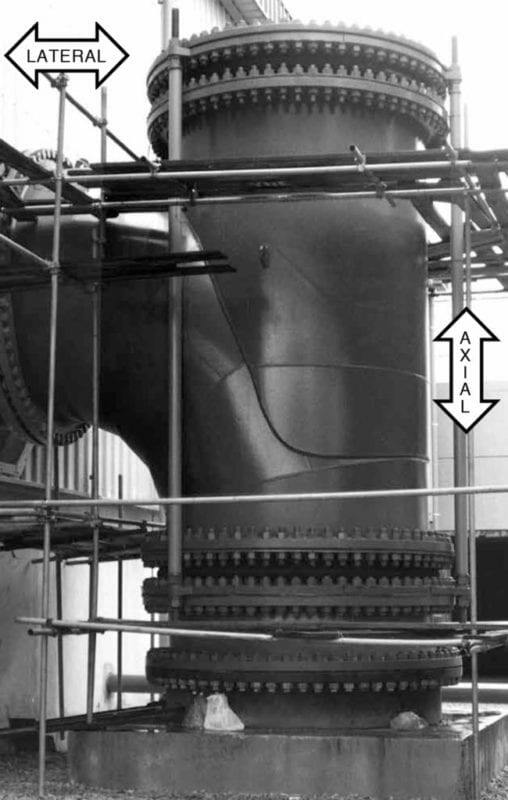 Mercer’s Style 501 96” diameter expansion joint employed in a typical configuration in a Malaysian power plant. Accepts all directional movements, minimizing pipe stresses and offering untold cost benefits as compared with the additional material and space required for expansion loops. Resists shock and fatigue by the flexibility inherent in its elastomeric construction, accepting the damaging forces generated by water hammer, pressure surges and seismic events. Features built-in offsets for greater flexibility in routing piping, minimizing space and material requirements, in addition to compensating for piping misalignment and settlement. Resists corrosion, erosion and abrasion by the selection of an elastomeric material optimal for the system’s fluid medium and temperature. and Mercer’s improved design features, including an optional bias ply angle and arch shape.